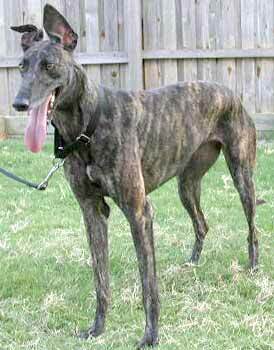 Angel, aka AZ Pedal Pusher, is a small dark brindle female who is a little over 5½-years-old, born January 22, 1998. Angel raced top grade A & B in 2000 and 2001 at Daytona Beach, Florida, and Victoryland, Alabama. 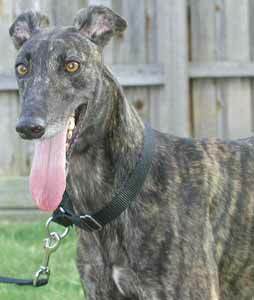 She is half sister to Wolf. Their sire was Brass and Sassy. Angel is petite with a sweetness that is irresistible. Angel is cat and small animal friendly.